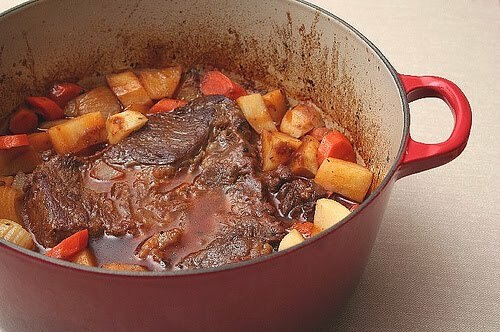 Pot Roast is a very popular dish in South Louisiana cooking. 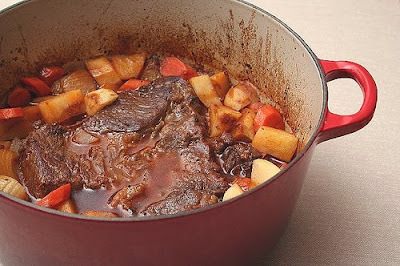 It involves the French technique of braising or pot roasting which comes from the French word “braiser”. The meat is seared at a high temperature, then finished in a covered pot with liquid, resulting in a succulent, flavorful meat and gravy. Coq au Vin is a well known French dish in which the braising technique is used. History aside, it’s one of my favorite wintertime dishes as it fills the house with a wonderful aroma and is a hearty, warming, filling dish for a cold winter night. It’s one of those things where you sit on the couch under a heavy afghan in your warm fisherman’s sweater eating a big bowl of pot roast while watching your favorite movie or football team with your family. And then you fall asleep, warm and happy. Hmmmm. When I was in Junior High, we lived on a corner; our side yard was very large and a long rectangular shape, completely unimpeded by shrubbery. It was the perfect place to play football and all the neighborhood boys and school friends would come play ball at my house in the fall during football season. 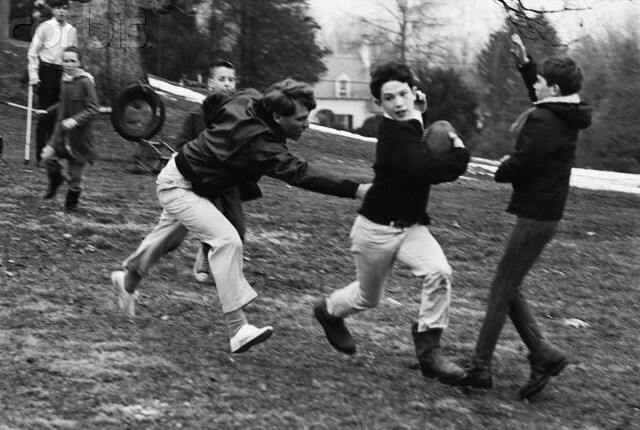 We would play no matter how cold it was and continue until it was so dark that we couldn't see anymore. By the time we quit and I went inside I was chilled to the bone, shivering badly and hungry as a bear. My mother usually had something cooking that was good and hot and she would hold up dinner until everyone went home and I came in. But what I loved and remembered about those meals was Pot Roast! By the time I changed clothes, she had dinner served. I would grab a bowl, go sit next to the fire and watch whatever my father had on TV and eat that wonderful incredible food. The warmth it brought would slowly spread through my cold body all the way to my finger tips and toes and leave me in a satisfied bliss. Salt, pepper and flour roasts, then brown both sides in oil. When browned, remove from pot. Add onion, celery, bellpepper and garlic and sauté, scraping the residue and drippings from the bottom of the pot. When vegetables are sauted well, push them to one side (or remove them entirely) and place roasts in bottom of pot. Place vegetables around the roasts; add potatoes and carrots and mix them with the sauted vegetables. In a large container, add 4 cups water and 3 tablespoons of bouillion (or 6 cubes) and dissolve. Pour into pot and add enough water to cover 1” over the top of the roasts and vegetables. Season with Tony’s and stir. Cover and bake in oven at 350 degrees (or cover and slowly simmer it on the stove) until roast is fork tender. Serve over rice. See Tips and Information on Better Than Bouillion paste. When browning floured meat, leave it alone and don't move it for a few minutes (the residual flour around it will brown), then you can turn it. Otherwise the floured crust will come off and stick to the bottom of the pot and burn.